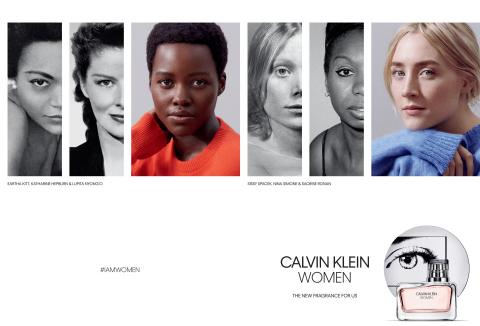 Calvin Klein, Inc., a wholly owned subsidiary of PVH Corp. [NYSE:PVH], and Calvin Klein Fragrances, a division of Coty Inc. [NYSE:COTY], today revealed the worldwide print advertising campaign for the new fragrance CALVIN KLEIN WOMEN , the first CALVIN KLEIN fragrance to be developed under the vision of Chief Creative Officer, Raf Simons. The campaign features Lupita Nyong'o and Saoirse Ronan. Award-winning actors and voices of their generation, both women are universally recognized for their unique talent, creativity, intelligence and strength of character. CALVIN KLEIN WOMEN is available for sale, starting today, on calvinklein.com, at CALVIN KLEIN retail locations, Harvey Nichols London Knightsbridge and on HarveyNichols.com. Lupita Nyong'o made her feature film debut in 12 Years a Slave, and received the Academy Award® in the category of Best Supporting Actress as well as multiple accolades including the Screen Actors Guild Award®, the Critics’ Choice Award®, the Independent Spirit Award®, NAACP Image Award® and the 2013 Hollywood Film Awards® New Hollywood Award for her performance. She went on to star in numerous critically acclaimed films including Star Wars: The Force Awakens, Queen of Katwe and Black Panther. She has a number of upcoming projects including Us, The Killer, Born a Crime, 355, The Woman King, and Americanah. Over the past fifteen years the artist Anne Collier has developed a highly-focused body of work that considers the formal intersections and psychological entanglements of photography, material culture, and the self-help industries. Her work was most recently the subject of a solo exhibition at Anton Kern Gallery, New York (2018); and a survey exhibition at FRAC Normandie, Rouen, France (2018). She was the subject of a major traveling survey exhibition organized by the Museum of Contemporary Art, Chicago (2014), and her work will be the subject of a solo exhibition at the Sprengel Museum, Hanover, in fall 2018, that will travel to the Fotomuseum Winterthur, Switzerland. Collier’s work is featured in the permanent collections of the Museum of Modern Art (New York), the Whitney Museum of American Art (New York), the Solomon R. Guggenheim Museum (New York), the Museum of Contemporary Art (Los Angeles), the Centre Georges Pompidou (Paris), and Tate (London), among others. Devised by perfumer Annick Menardo and master perfumer Honorine Blanc. Delicate orange flower petals, fresh eucalyptus acorns, and a rich Alaskan cedarwood are combined with black pepper and lemon Sfuma, a bouquet of Magnolia Grandiflora and Jasmine Absolute, and the seductive strength of Olibanum essential oil and Ambrox® Super. Founded in 1968 by Calvin Klein and his business partner Barry Schwartz, we have built our reputation as a leader in American fashion through our clean aesthetic and innovative designs. Global retail sales of CALVIN KLEIN brand products exceeded $8 billion in 2017 and were distributed in 110 countries. Calvin Klein employs over 10,000 associates globally. We were acquired by PVH Corp. in 2003. IMAGE CREDIT: Anne Collier for Calvin Klein, Inc.